1. In a medium bowl, mix together the icing sugar, lime zest and juice. Add the cream cheese to the bowl and, using an electric whisk, whip to combine. 2. In another bowl, whip the double cream to soft peaks. Fold the cream into the cream cheese and lime mixture. 3. Blitz the ginger nuts to crumbs in a food processor or place in a freezer bag, seal, then crush using a rolling pin. Combine with the melted butter. Spoon the cheesecake base into 6 clean jam jars (about 200g each), gently pressing the mixture into the bottom. 4. 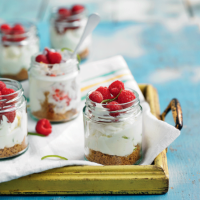 Spoon in the cheesecake mixture and top each one with raspberries – the number you use will depend on how wide your jars are. Seal each jar with a lid and chill well before packing into a cold box for your picnic. Don’t forget the teaspoons!